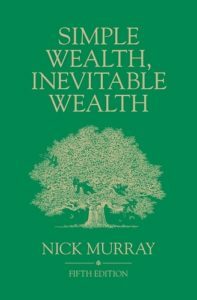 Nick Murray delivers the timeless “simple truths” of investing that never change regardless of where things stand with the markets. Where asset allocation fails is the argument that broad diversification must be used to balance returns and volatility — a “need for stability” — and capital preservation. Murray’s bias: stocks are the only way to wealth because it’s the only asset with decent returns after inflation and taxes. Most investors are better off — will get better returns — with mutual funds or index funds, then trying to pick stocks. Most investors are better off with a solid, strong, caring financial advisor (another of Murray’s biases, though hard to argue against). Most people ask the wrong questions, like what funds should I own? Financial Freedom should be the primary goal of everyone — to have enough screw you money to be able to do whatever you want. Becoming wealthy is simple, but not easy. Why is it not easy? — Most investors fail because they don’t stick it out “no matter what is happening in the markets and the world”. They don’t have the discipline to look beyond the bad news, good news, etc. to see the potential of equity growth. Investing also requires both the right amount of time and money to be successful. What you do, your actions, are more important than what you know. A portfolio is not a plan — it’s the last step in creating a financial plan. The portfolio is the working part of a financial plan to achieve your goals. Beating the market is not a goal. Which funds you own is the least important thing. No one knows how history turns out, or which funds will perform best. It’s not which fund you own, but that you owned a fund, to begin with. You can get lucky picking the best funds, stocks, etc. but it’s not a requirement to be wealthy. What matters is: did you invest in a stock fund over a bond fund, CD, savings account? “Be an owner, not a loaner” – owners grow wealth (stock ownership), lenders don’t because fixed income securities don’t build wealth, so much as they maintain it, but with the higher risk of loss to purchasing power. Chasing Returns — the need to always have the “best fund” will inevitably eat into your savings. Price Matters — view declining markets as a chance to buy more shares, not the end of the world. Behavior is the main driver of success — You’re not a victim. It’s not the market’s fault. It’s just your bad behavior. Financial news is timely — it drives you to act. Investing Principles are timeless — requires very little action. Financial news is in the business of making things sound more important than it really is. If it didn’t sound important, nobody would pay attention. Don’t believe me. Go back to the biggest financial news story last month, how important is it to you today? Financial Advisors — worth their weight in gold if they help you avoid mistakes by keeping you focused on your life’s goals and not on the market. The argument against advisors — 1) people are smart and disciplined enough to build and stick to a portfolio, and 2) that advisors are greedy, stupid, corrupt, or cost too much. — Human nature disqualifies most people from #1 and most real advisors don’t fit into #2. Investors need to ask if an advisor add more to your overall, long-term return, then you could do yourself? At least “1% more”? Why you need an advisor? To help build a better long-term portfolio based on your goals, to prevent future mistakes or bad behavior that would have cost you money, and the extra cost is worth it to avoid the time, energy, and stress of doing it on your own. Advisors can’t do — predict/forecast the economy, forecast/time the markets, predict future performance of funds. No one can. Great advisors manage people, not money, because your behavior has a bigger impact on long-term performance than which investments you own. Terrible advisors claim to predict the future, to time the markets, to build the perfect portfolio to beat all portfolios, and do it with little to no risk to you. All are hollow promises to enrich the advisor, not you. Building a portfolio – investment plan – is the last step for a great advisor. Common sense says owners of good businesses are the ones who achieve real wealth in this country. Risk/reward favors the owner. Owners have unlimited upside. Lenders have a limited upside. Owners get all the profits after costs and loan payments. Lenders see none of the profits, only the loan payments. A good lender never takes a big risk, since the downside is the collateral. Essential truth: The future is unknowable. All we have to go on is history and probability. Historical returns from 1926 – today: The only consistency is just how inconsistent it is from one decade to the next, which offers some basic truths (credibility) to historical asset returns. The one thing we can say based on history, the U.S. economy is nothing if not resilient. Murray covers the consistent growth and change despite all the “bad” news and end of the world threats that kept popping up. The U.S. economy has seen it all and come back from the brink every time. It’s seen wars, crises, recessions, depressions, inflation, deflation, burst bubbles, and the neverending end-of-the-world whispers and screams. The US has come back better and stronger each time. Despite all that, the American capitalist machine was constantly creating, innovating, and driving the economy forward every step of the way. The US economy is unlike no other. How anyone can lose faith in that track record is beyond me. Stocks returned twice that of bonds from 1926 to 2011. Real stock returns (after inflation) were 3x that of real bond returns from 1926 to 2011. After inflation and taxes, stocks returned 4x more than bonds. Bonds had almost no net return after inflation and taxes. Bond investors tread water through history. Real wealth comes from long-term stock (business) ownership. Future stock returns will probably be some multiple of bonds. Unlikely to change going forward. Most people misunderstand risk. They think volatility is risk. Volatility is a short-term concept that passes with time. It’s nothing but tiny moments of opportunities for anyone focused on the long term. Risk = permanent loss and/or outliving your money. The real risk is loss of purchasing power. Myth: stocks are riskier than bonds. — Because bonds are in constant threat of losing to inflation. Stocks aren’t meant for short-term — under 5 years — goals. Too much uncertainty. Possible returns aren’t guaranteed. Retiring in 5 years or less doesn’t count as a short-term goal. The under-5-year rule doesn’t apply because retirement is the start of a new goal — not to outlive your money. Retirement income must keep up with inflation for another 2-3 decades. More concentrated number of stocks offers the best chance to outperform the market…and underperform too. The stock market as an asset class can’t go to zero, one stock can, and do regularly. Historical stock returns show that the chance of losing money declines over time. Yes, any given year could end in a loss, but string together several decades of returns and you most certainly will be better off in stocks than any other asset class. All you have to do stay patient and stick with the plan. The U.S. free marketplace is self healing. Better companies thrive and prosper, while inferior ones fall by the wayside, with new companies, technology, and innovation always driving new business creation. The U.S. economy is “one of permanent advance punctuated cyclically by temporary decline”. Every bad market decline ended and a new record high was reached. Stock prices follow earnings, not the other way around. What really drives stocks is earnings growth. Prices only fluctuate in the short term based on how much investors are willing to pay for that growth today. Growing earnings lead to higher prices eventually. Being afraid of the next market decline is pointless because history shows that the market falls quite often. Anyone with a long time horizon should root for bear markets. Asymmetrical Loss Aversion: We hate to lose more than we love to win. Most people can’t tell the difference between volatility and loss. It can lead to a panic response to protect whatever is left when they should see the long term possibility and opportunity. Volatility produces a temporary loss that only an investor can make permanent. Temporary vs Permanent Loss? Buffett’s personal Berkshire shares fell $6,200,000,000 from July 17 to August 31, 1998. How much money did Buffett lose? Nothing, because he never sold. He had no reason to sell, because he had faith prices would eventually follow earnings and that US economy would recover. When fear drives decisions you will ultimately lose. “[Investing] is the age-old, never-ending emotional battle between fear of the future and faith in the future”. Nobody says they sell because of fear. It’s always some other excuse. Fear is never the reason used to sell. We make up excuses instead. Selling out fear, sticks you with a new problem — when to get back in. Anyone who sells out of fear, hoping to get back in before the turn, most likely misses it every time. Sell at the bottom, buy at the top, repeat until broke. Time in the market matters more than timing the market. Real wealth comes from owning and holding stocks regardless of what is going on. Relying on “safe” fixed-income assets – savings accounts, CDs, and bonds – is fatal to your wealth. People live longer. You must invest accordingly. Advances in medicine have moved the average lifespan into the 80s, with many people living into the 90s. Where will it be over the next few decades? You’re left with two options — work longer and/or invest in assets that outgrow inflation. Falling short of inflation is the biggest risk. Maintaining, outgrowing, your purchasing power is the primary goal. Stocks offer a chance to do it. Relying on bonds for income ignores the risk of not owning stocks. Bonds are in constant risk of falling short of inflation. One option is to find dividend stocks that regularly grow dividends at a rate faster than inflation. This way, dividends alone outpace inflation, while capital gains continue to grow your wealth. People get the real risk (loss of purchasing power) wrong because they ignore the power of inflation when it’s been so obvious their entire life. They underestimate life expectancy as no longer than the last generations, they let fear of loss drive decisions, they’re a product of the market environment they grew up in and parents experienced, and they don’t truly understand what the financial words mean. Biggest lie ever told: “stocks are risky, bonds are safe.” — Risky or safe regarding what? Risk is a loss of purchasing power, “safe” outpaces purchasing power. You can be ultra safe and keep the same amount of dollars but lose money to inflation. You can be safe, your interest yield stays the same, but costs double and you lose money to inflation. If your costs double, and dividends double, you preserve your income. The only time bonds preserve purchasing power is with little to no inflation or deflation. Every other time, bonds are at constant risk of being overrun by inflation. People regularly ignore the long-term growth potential of stocks (and dividends) versus bonds. Only seeing yield ignores a big contributor to the total return of stocks — capital gains. The biggest mistake with dividend yield: The battle between paid more now versus paid more later. Investors typically choose the slower growing, higher yield over faster growing, lower yield ever time. They fail to account for potential future dividend growth and it negatively impacts their future wealth. Bond yield is worse because there are no capital gains. When bond prices rise, you’re being paid for future yield. Why use bonds? Bonds help to relieve the pain of short-term volatility. Keys to avoiding groupthink: Don’t let the news make decisions for you, watch for commonly used words and catchphrases and how often they’re used. Stocks won’t make you wealthy. Your behavior around stocks makes you wealthy. Stocks need your help. The only thing you control, your behavior, is the biggest factor in your success with stocks. Four behavioral tactics: 1) set goals in dollars and dates, 2) build a plan to reach those goals, with a specific return in mind, 3) dollar cost average your savings, 4) get retirement income needs from regular withdrawal from stock funds. But first – make sure life and income are insured — via life and disability insurance — before starting any investment plan. You can’t have your plan interrupted by a major loss of income. But second – get debt under control. No high yield credit card debt Pay off a chunk of mortgage too. Less debt = more piece of mind. On #1 Set specific dollar/time goals — specifics make it easier to rationalize everything else. For example: saving for retirement vs needing $50,000/year in retirement income. It’s easier to save for the latter. Specifics raise more questions like how much money is saved already, how much time is left, and how much is needed each month to reach it? On #2 Make a plan to reach goals — a plan lets you track your progress over time and keeps you mentally in the game, focused on the bigger picture. On Dollar Cost Average — “treated like your most important monthly bill”, “is heaven’s own market timing system for the blissfully clueless”. Also, dollar cost averaging automatically buys more shares at troughs and fewer shares at peaks, so you end up with above-average returns. Bigger market declines = bigger returns. A bear market is just a sale on stocks. Investors with time should root for bear markets. “DCA makes you love — and long for — bear markets”. You should want more, not less volatility. Temporary falls let you buy more shares than if the market was higher. Starting early — little money to invest but so much time — compounding picks up the slack. Markets are cyclical – periods of below-average returns are followed, at some point, by periods of above-average returns. The market averages a 10% return. It’s an average. You must be prepared for returns above and below that. During times of underperformance, doing nothing is usually the best response. Chasing returns = switching funds is an attempt to fix a temporary shortfall you can’t control that almost always backfires to make things worse. Reacting to market changes is not a plan. With a temporary shortfall, you can control: the ability to save more, retire later, and/or take lower withdrawals. Stock market goes up nearly 4 out of every 5 years, on average. On #4 Regularly withdraw no more than 5% of retirement balance for income – should leave enough margin for error to not outlive your money, assuming you focus on total return and not current yield. The last lesson: avoid big mistakes — behavioral errors that you can’t recover from. A concentrated number of stocks gives the potential to outperform and underperform a basket of stock funds. Owning everything means you always own the hot sector and whatever the next hot sector will be. DCA makes sure you’re “loading up on it” before it takes off. Market cycles don’t follow the same path. Diversify across different sectors, size, and country. It should lower big swings because they rarely move in unison. Growth and value, big and small cap, foreign and domestic all go through cycles. Keep your portfolio simple. Less is more. Don’t be a collector of funds, be an investor. On finding the perfect fund or portfolio — It’s not about owning the best fund or the perfect stock. You can spend months optimizing the perfect portfolio, having the right amount of every asset class. None of it matters if you can’t behave. Indexes are not created equal. “The issue is cost” — high cost vs low cost — you can find low-cost index funds but also find low-cost active funds focused on long-term, buy and hold, low turnover strategy. Compare holdings: read the fund objectives, then check to see if its true. Don’t pick funds based on short-term – 5years or less – performance. Worst portfolio strategy: buying managers that are hot…selling when they’re not. Avoid the constant temptation to “tweak” your portfolio. A diversified portfolio means something is always performing great while another is lagging. One big mistake is the difference between investment returns and investor returns. Avoid Mistakes = better returns. Over diversification – you’re a collector, not an investor. Under diversification – narrows a portfolio down to “what’s working” which eventually will stop working at some point too. Can you handle a portfolio that stops working from time to time? Most can’t. You can get wealthy by under diversifying, but can you stay wealthy? Most company’s and stocks eventually fade off into the sunset. Euphoria – when you stop seeing risk. How do investors see risk? As markets rise, investors think the risk of it falling again decreases. As markets fall, investors think risk of it falling further rises. When investors forget markets can fall, and only focus on missing out on returns, they’re euphoric. Leverage – Leverage can work, but…leverage used wrong magnifies mistakes. If you can’t see a positive future outcome, you’ll never stick with your investments long enough to find out. There is always some end of the world event to be afraid of. Some crisis is always around the next corner. History tells us, even real crises abate.